Kai Rönnberg has the position of Vice President, Services, and relocated to Outotec’s Sydney office in the spring. After his spring flu in Australia, it’s all go for Kai Rönnberg. “The main focus of daily life is on working hard, but I have been playing golf, beach volley, and have even bought myself a surfboard”, Rönnberg reports. He has the position of Vice President, Services, and relocated to Outotec’s Sydney office in the spring. By now, he feels familiar with his new responsibilities, colleagues and hometown. 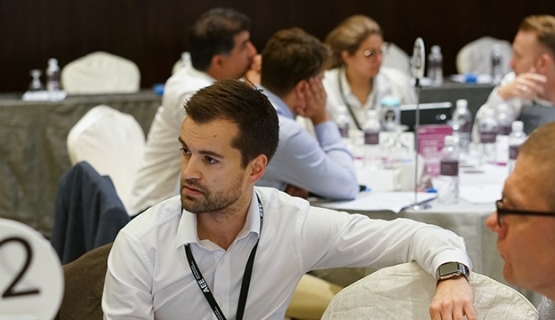 In August, Rönnberg’s MBA studies took a couple of steps ahead at the Aalto Executive Summit in Singapore. The Summit is Aalto EE’s annual, one-week, concise study period of several modules, which Finland and Singapore take turns to arrange each year. The summit provides Aalto EMBA and MBA students the chance to complete several modules and meet up with each other during the week. Key lesson from Aalto Executive Summit: strategy isn’t functional until it is tested in practice." Rönnberg is pleased with what the week had to offer. He especially praises the Executing Strategy in Uncertainty element during the first day, which offered plenty of food for thought and insight for implementing Outotec’s new strategy. The main lesson is crystalized in the thought that a strategy isn’t functional until it is tested in practice. Rönnberg gives special mention to Professor Rebecca Homkes’ practical examples. Studies during the week were titled Leading for Growth, Global Key Account Management, and Succeeding in Digital Landscapes. Rönnberg goes on to rate the week as a “good set”. He also gained some new, interesting contacts during the evening events. Studying while working abroad seems to work, although relocating forced Rönnberg to carefully weigh up the combination. He finalized the Business Project section with his MBA group last week, and a sense of satisfaction can be detected in his voice over the phone. Studying while working abroad seems to work, although relocating forced Rönnberg to carefully weigh up the combination." Rönnberg participated via Skype, as the work was presented to Outotec. He is pleased that corporate management received the proposals with interest. According to Kai, the Aalto MBA group members even began to cultivate some mining jargon after a couple of months into the work. The project clearly benefited everyone involved. In November, Rönnberg will be returning to Finland for the Business Simulation module. After that, he only has one more course left before graduating next spring. But first Kai has the spring ahead of him in Australia and daily life in his own home, where he lives with his girlfriend, who moved along with him.